An old standby for parties and it does not require too much effort to make. Apparently, the name of the dish is derived from the Aztec words meaning “avocado sauce,” which is basically what guacamole is. Serve with tortilla chips and salsa, or use in a taco or burrito. Scoop out the avocados into a bowl, and then add the onion, garlic and cilantro. Put a couple of the avocado pits in the bowl as well. Add the spices and lemon juice, and then add the tomatoes last. Adjust the spicing to taste. To prevent discoloration of the guacamole, include a couple of avocado pits, add the lemon juice and also cover the guacamole with plastic wrap so that the wrap is touching the guacamole (and there is no air to oxidize the guacamole). The “special ingredient” of a friend is to use whole cumin seeds that have first been toasted, and then hand-ground. That requires more time, but the results are worth it! For a quick-and-dirty version of guacamole, just add the avocados and store-bought salsa. 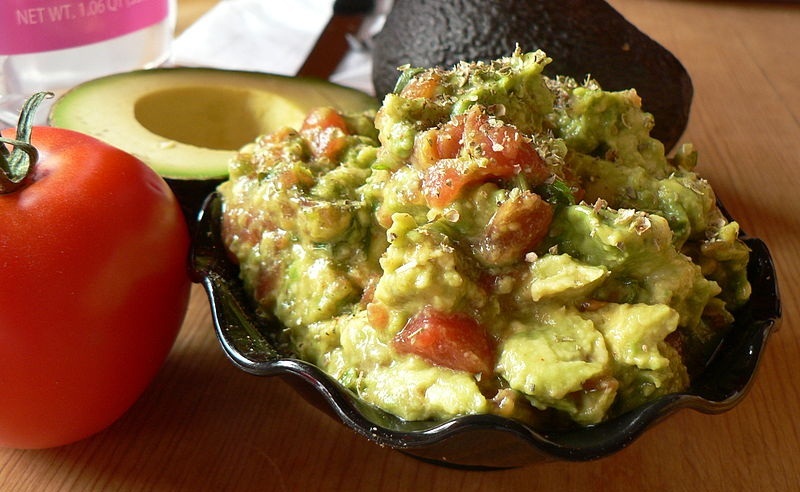 This entry was posted in Appetizer, Mexican, Recipes and tagged Avocados, Guacamole, Salsa. Bookmark the permalink.